This white paper presents the findings from an analysis of the fiscal implications for vehicle owners of changing from the current statewide fuel tax to a “road user charge” (RUC) based on vehicle-miles traveled (VMT). Since 1923, California’s motor vehicle fuel tax has provided revenue used to plan, construct, and maintain the state’s publicly funded transportation systems. Over time, improvements in vehicle fuel efficiency and the effects of inflation have reduced both the revenue from the fuel tax and its purchasing power. Thus, there is growing interest among policy makers for replacing the state’s per-gallon fuel tax with an RUC based on VMT. This study analyzes the 2010-2011California Household Travel Survey (CHTS) to identify the potential effects this policy change would be likely to have on households across the state. 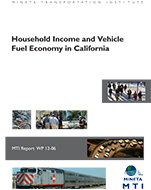 The analysis found that while daily household fuel consumption and VMT both appear to increase with household income, urban and rural households show roughly the same amount of fuel consumption and VMT. No statistically significant difference in cost was found between the two programs in any income group. This suggests that an RUC designed to collect the same amount of revenues statewide as the current fuel tax would not place a significant financial burden on California households. Dr. Ferrell began his planning career in 1995 working for the Metropolitan Transportation Commission (MTC) on intelligent transportation system (ITS) applications for traffic management. Since 2000, he has worked as a transportation consultant, and in 2010 he co-founded CFA Consultants, a transportation planning and research firm. Dr. Ferrell completed his doctoral studies in city and regional planning at the University of California, Berkeley in 2005. His studies focus on the relationships between transportation and land use. His research experience includes the evaluation of transit facilities, transportation policy analysis, transportation and land use interactions, travel behavior, and analysis of institutional structures. As a practitioner, he has developed traffic impact studies for mixed-use, infill, and transit-oriented projects; analyzed the impacts of specific and general plans; planned and implemented intelligent transportation systems; and developed bicycle and pedestrian plans. He recently completed TCRP Report 145, Reinventing the Urban Interstate: A New Paradigm for Multimodal Corridors and is currently working to complete TCRP H-45: Livable Transit Corridors: Methods, Metrics, and Strategies. He has also taught several graduate planning classes in the San José State University Urban Planning department and the University of California, Berkeley City and Regional Planning department. David Reinke began his planning career in 1973 with the London Borough of Camden, where he worked on a livable neighborhoods plan, priority bus lanes, and development of a traffic-monitoring program. Since then he has worked in both public and private sectors for a number of organizations including Crain & Associates, BART, Dowling Associates, and Kittelson & Associates. His areas of specialization include transportation economics, travel demand modeling, road pricing studies, statistical analysis, machine learning, and software engineering. Past projects include development of travel demand models, analysis of proposed toll lanes, long-range transit plans, development of multimodal level of service measures for urban streets, and a number of research projects for the National Cooperative Highway Research Program. He is a member of IEEE and the Transportation Research Board (TRB) and is a member of TRB committees including Statistical Methods (ABJ 80) and Traveler Behavior and Values (ADB 10). Past TRB committee memberships include Artificial Intelligence and Advanced Computational Methods (ABJ 70) and Transportation Economics (ABE 20). He holds an M.S. in Civil Engineering from the University of California, Berkeley; a Master of Regional Planning from Cornell University; and a B.S. in Electrical Engineering from the Massachusetts Institute of Technology.